Early day one, crews assembled exterior walls. At promptly 7 a.m. Monday morning on Feb. 4, 2019, a horn signaled the beginning of a home build. Within minutes, walls for four homes were raised amongst a ‘blitz’ of activity. The sound of heavy machinery soon filled the air as teams lifted and set their trusses and bracing. One team experienced a crane malfunction, but continued lifting and setting the heavy trusses the old-fashioned way, one at a time, by hand. All the hustle was for a good cause. Four builders participated in Habitat for Humanity Greater Orlando & Osceola County’s 2019 Builders Blitz where participants donated building materials, labor and expertise to construct four new homes in just five days. 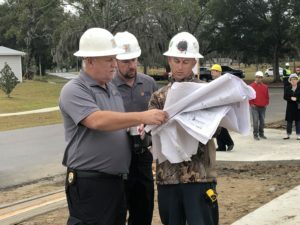 The ambitious project is a continuation of the ongoing development at the Apopka neighborhood Arbor Bend, which broke ground in 2017 and hosted the 2018 Builders Blitz. Arbor Bend now has 14 completed Habitat for Humanity homes with 20 more under-construction or in the planning stages. Participating builders this year included Park Square Homes, PCL Construction, Pulte Homes and K. Hovnanian Homes. 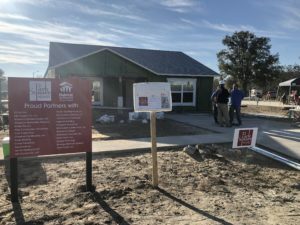 In just under a week, each builder constructed a home in a friendly competition with each other while working toward the common goal of developing quality move-in-ready homes for local families in need of affordable housing. To assist the builders with accomplishing this feat, Orange County Government Division of Building Safety dedicated labor and resources to ensure that all plan reviews, permitting and inspection activity was expedited. By the morning of day two, homes had windows and completed roofs. In support of the Arbor Bend affordable housing community, Orange County Government has contributed approximately $1.6 million toward site acquisition and development and offers all qualified homeowners up to $20,000 in down payment assistance. 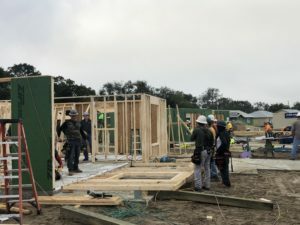 “To pull off the incredible task of constructing four homes in five days requires the partnership of generous builders, the engagement from all their subcontractors, support from Orange County Government, and months of planning and preparation,” said Catherine Steck McManus, president and CEO of Habitat for Humanity Greater Orlando & Osceola County. Deputy Chief Inspectors Chris Sukut and Neil Swiger review plans with a contractor during inspection. Orange County Deputy Chief Building Inspectors Chris Sukut and Neil Swiger were on site during the project to oversee the work and complete 80 required inspections. This enabled the inspections to take place as soon as the required work was ready to be reviewed. Trade inspectors, including plumbing, mechanical and electrical trades were summoned by the Deputy Chiefs to appear on-site when their inspections were ready to take place to ensure the highest quality standards in building codes. Pulte Homes had an early lead on day one, completing its truss installation and framing inspection first. By the end of the day, all homes completed inspections for framing, sheathing, roof dry-in, windows and rough-ins for mechanical, plumbing and electrical. All four houses were taking shape by the end of just one day. Park Square’s home was in the lead by completing its roof final inspection, dry wall, insulation and was moving on to siding. During day two, at an incredible pace, progress on all the homes continued smoothly. Mechanical (HVAC) installers had completed their heat and air conditioning installations and inspections. Final roof inspections were completed on all homes, dry wall was completed in the Pulte and Park Square homes, PCL was hanging dry wall, and K. Hovnanian was not far behind. Siding was applied to all homes and primed for paint jobs. The four homes that were merely foundations the previous morning, were now closer to completion than other nearby homes that were being built on a normal schedule. In the afternoon, Duke Energy arrived ahead of schedule to prepare to energize the homes. By day three, all required building and sub-trade inspections had taken place as each builder worked toward reaching their final inspection. Landscaping, such as tree planting and sod placement, was underway for several of the homes. Builders continued working at a furious pace in order to reach final inspections by Friday. Park Square was the first to call in a final inspection on day three, as the other builders were still readying their homes. K. Hovnanian had pulled into second place, completing exterior siding and painting. All homes were on track to be move-in-ready by Saturday morning. The speed, professionalism and efficiency of these builders were on full display. Orange County Mayor Jerry Demings with Habitat for Humanity Greater Orlando & Osceola CEO Catherine McManus and Board Members at Arbor Bend. By 7 a.m. of day four, all dwellings had been painted and prepped for final inspections – an amazing transformation had taken place at the job site over the past three days. Park Square had completed its final inspection first on day four with K. Hovnanian right behind. Pulte Homes and PCL Construction were working on final touches and landscaping before their final inspections. All builders did an incredible job and were on track to complete the homes ahead of the five-day deadline. Park Square Builders complete their home. 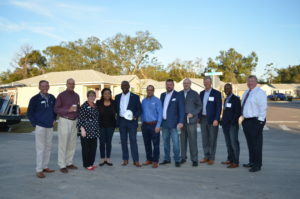 Also on day four, Orange County Mayor Jerry L. Demings arrived at the site for a tour and spoke at breakfast recognizing donors, the four builders involved in the project, volunteers, Orange County Government and the dedicated work of the building and trade inspectors. “These types of fast-paced projects are done without sacrificing quality or safety in the home for these future homeowners. It wouldn’t happen without the hardworking staff we have at Orange County Government,” Mayor Demings said. On day five, all homes had completed their final inspections and were being readied for their new Habitat homeowners. The final chapter in this incredible story will unfold on Saturday, Feb. 9 at 10 a.m. with a celebratory dedication ceremony where the keys for the brand new homes will be presented to the new homeowners. Sponsors of the Builders Blitz include Rosen Hotels and Resorts, KMI International – who also had six volunteers on site every day to assist the teams with the construction – the Toll Brothers Home Builders, Alight, Huber and James Hardie. 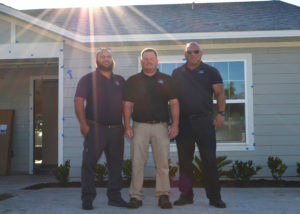 For more information on Habitat for Humanity Greater Orlando & Osceola County, visit www.habitatorlandoosceola.org. Progress between days two and four. 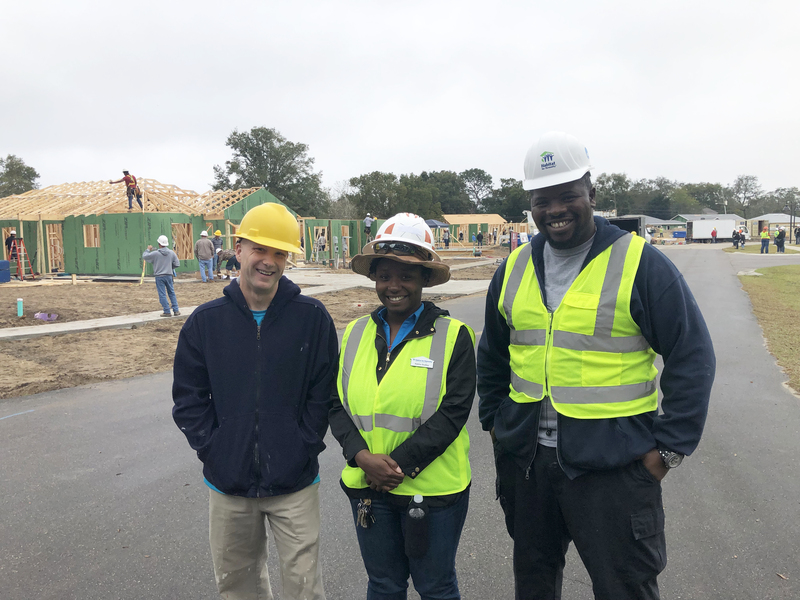 Photo Caption:Habitat for Humanity employees overseeing the 2019 Builders Blitz at the Arbor Bend community in Apopka.